Raymond van Barneveld has slipped to seventh place in the table following back-to-back defeats. This is the first of two fixtures that he will play in Sheffield on night ten, and it’s a night which could well make or break his aspirations of a play-off place. Van Barneveld found himself on the end of a 7-0 shellacking by Michael Smith last Thursday evening in Liverpool. Barney was below his best but take nothing away from Smith who was outstanding throughout. Last Sunday he reached the last 16 at a Players Championship tournament, which was only the second time he has progressed that far in a ranking tournament during 2018. Daryl Gurney drew 6-6 against Peter Wright last time out and is now unbeaten in his last five Premier League matches. His only defeats in the tournament so far have been against Michael van Gerwen and Michael Smith – the top two players in the league table. His level of performance has risen to a consistent high level over the last few weeks, highlighted by the fact he has averaged over 98 in each of his last four Premier League matches. During his opening five matches he averaged over 98 on only one occasion. Gurney’s tournament checkout percentage is still amongst the lowest in the league but he is showing an improvement; he has registered a checkout percentage of over 50% in two of his last three matches and has taken out four ton plus finishes over his last three matches. With only one point and one place separating Van Barneveld and Gurney in the league table, this is a crucial fixture. 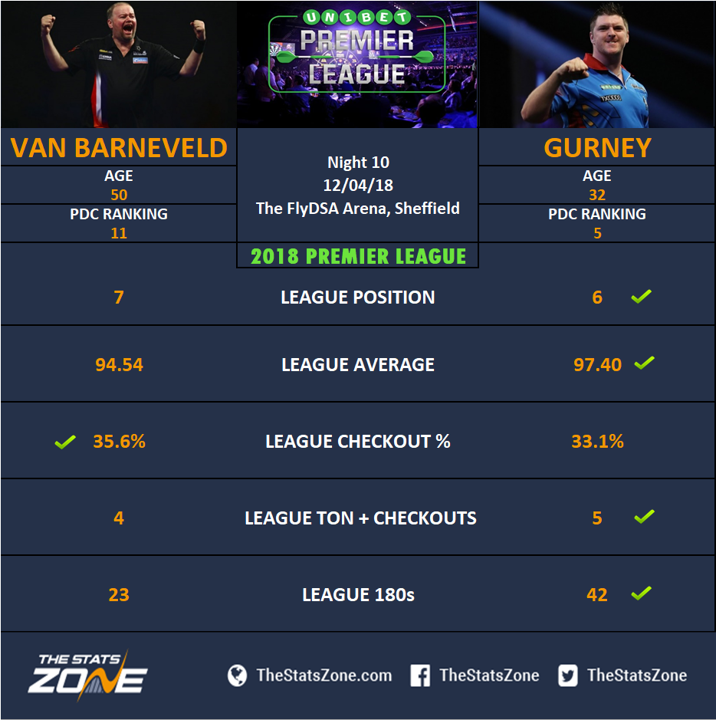 Gurney comes into the match on the back of a good solid unbeaten run in the Premier League where he has played very consistently and most importantly he has been more efficient at hitting doubles. Barney has suffered back-to-back defeats over the last two weeks and has too often underperformed during this campaign. He really needs to turn things around if he is to make the top four. When they met back in February on night one of the 2018 Premier League they drew 6-6 with Gurney missing three darts at doubles which would have given him a 7-4 victory. Gurney is playing to a higher level of consistency and has grown in confidence on the doubles since then and those factors could lead to a win for the Northern Irishman.